Holding an event in Annapolis, MD? DoubleTree Hotel Annapolis has the perfect event spaces to fit any conference or party. 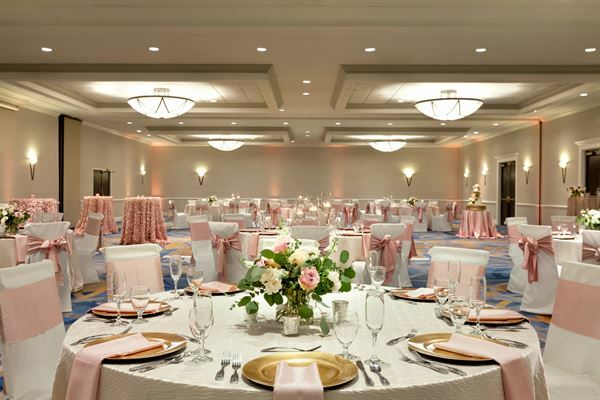 DoubleTree Annapolis can cater for large-scale events with up to 700 guests. Each of our spacious ballrooms at the hotel can be arranged in various set-ups to suit the style and requirements of your event. Our team of experts are ready to organizing your next conference, sales presentation, corporate retreat, theme party or formal affair. No matter what the event DoubleTree Hotel Annapolis can help make planning and hosting your meeting easy. Plated Breakfast | $18 - 20 per person • Stars & Stripes • French Toast/Pancakes • House-Made Frittata Continental Buffets | $11 - 18 per person • Supreme Continental • Executive Continental • Express Continental Plated Lunch Entrees | $24 - 29 per person • Jumbo Lump Maryland Crab Cake • Barbeque Shrimp Skewer • Grilled Salmon with Lemon Butter • Seared Flank Steak • Orange Roughy with Baby Shrimp and Red Pepper Sauce • Grilled Chicken Breast with Honey Barbeque Sauce and Pineapple Salsa • Chicken Piccata • Stuffed Shells with Marinara Sauce • Portobello Napoleon • Vegetable Fusilli Primavera Plated Dinner Entrees | $33 - 46 per person • Boursin Chicken and Garlic Shrimp • Chicken Chesapeake • West Coast Marinated Grilled Chicken • Tuscany Chicken • Chicken Piccata • Filet Mignon and Salmon • Beef Medallions and Chicken Marsala • Roasted Prime Rib • Filet Mignon with Bearnaise Sauce • Seared Flank Steak • Jumbo Lump Crab Cake and Filet Mignon • Jumbo Lump Crab Cake and Shrimp Skewers • Maryland Jumbo Lump Crab Cakes • Grilled Swordfish with Red Pepper Sauce • Grilled Salmon Please see attachment for additional information and menu options. Your Wedding Package Will Include: • Four hour name brand open bar • Complimentary parking • Complimentary cake cutting service • Bartender, carver, butler and attendants • Private welcome reception for the wedding party • Champagne toast for all of your wedding guests • Chilled bottle of champagne on your wedding night • Dinner for two in our Ports of Call restaurant on your first anniversary • Deluxe overnight accommodations for the Bride and Groom to include a full breakfast To Accent the Elegance of your Special Day, We Offer the Following Complimentary: • Floor length white tablecloths, and white napkins • Elegantly decorated hors d’oeuvre and buffet tables • Elegant centerpiece to decorate your guest tables To Enhance your Reception, the Following Options May be Added at an Additional Cost: • Wine service with dinner • Premium brand liquors • Extended hours for reception • Ballroom for ceremony Special packages available for Friday and Sunday Receptions. Please see attachment for additional information and menu options. We used the Doubletree Hotel to host our daughters Sweet 16 Birthday Party. Katie and her team went above and beyond to help us make this day one to remember. I would highly recommend the Doubletree in Annapolis for any event. The staff is more than capable of supporting and making it a success. Potomac Riverboat Company brings unforgettable events to life on the water. Whether you’re planning a milestone celebration or a casual outing, we have options across our signature fleet to suit your needs and accommodate anywhere from 20 to 200 guests. Customize your experience, from cruise time and duration to entertainment and more. Each of our distinct vessels serves as a completely private venue on the water. Docking locations include Old Town Alexandria and the Mount Vernon Estate in Virginia; National Harbor and Gaylord National Hotel in Maryland; and Georgetown in Washington, DC. Our lives are filled with benchmarks of celebrations: weddings, anniversaries, bar mitzvahs, quinceaneras, baby showers, bridal showers, holiday parties, birthday parties, corporate meetings. Avant Garde Ballroom and Event Center is THE place to help you create memorable celebrations. If it's pizzazz you want, we've got it! A distinctly contemporary space, it accommodates up to 200 people. Its elegant floor-to-ceiling beveled mirrors, resilient maple floors, full kitchen, dressing room, mood lighting, in-house sound system and ample free parking gives us a cutting edge above everyone else. Seeing is believing. Visit us at 5268-M Nicholson Lane, North Bethesda, MD 20895 or call us today at *NOT DISPLAYED* . At TPC Potomac at Avenel Farm, creating memorable events is our specialty. So, why not plan the most special of days with us? TPC Potomac is one of the premier reception venues in the Mid-Atlantic region. We provide intimate banquet rooms and private function areas that are ideal for any special occasion. Our 35,000 square-foot clubhouse is the perfect location to host rehearsal dinners, engagement parties, holiday celebrations, corporate or family gatherings. The carefully appointed Chesapeake Room is ideal for receptions and other large gatherings. The 3,000 square-foot Chesapeake Room can seat up to 200 people. There is plenty of room for entertainment, music and dancing. Our exceptional culinary staff offers a variety of dining options, while our team of event planning professionals will ensure that your special event remains stress-free. Imagine holding your family celebration in our upscale “2118” room and hosting a dinner coupled with fine wine from over 2118 selections in the walk-in wine room. The TreeTops Atrium Wedding and Event Venue is Secluded, Private and Serene to allow you the ability to Relax, Plan, Host and enjoy your Special Celebration. We are the Venue of Choice for Wedding Ceremonies & Receptions, Bridal Showers, Rehearsal Dinners, Baby Showers, Milestone Birthday Celebrations and Bridal Showcases. The TreeTops Atrium has a Glass Elevator, Marble Floors, and Track Lighting. The Hilton Garden Inn Washington DC / Bethesda is nestled in the heart of chic, downtown Bethesda, MD. This bustling urban district is just seven miles northwest of Washington, DC, and home to nearly 200 restaurants, two live theatres, 20 art galleries, and some of the best shopping in the Nation's Capital. The hotel is conveniently located three miles from Glen Echo Park and only one block south of the Bethesda Metrorail's Red Line Station, which puts you and your guests only minutes away from famous DC attractions like the Smithsonian Institute, Washington Monument, U.S. Capitol, and the White House. Our hotel offers a comfortable, contemporary oasis with direct access to the hotel's Mezzanine level where you can host your Wedding Rehearsal, Brunch, Welcome / Hospitality Reception, and Bridal Shower. All 216 guest rooms feature: complimentary wired and wireless Internet; large work desk with convenient, desk - level outlets, and ergonomic Mirra chair by Herman Miller; two dual - line phones with data port and voicemail; complimentary remote printing to the business center; refrigerator and microwave oven; seating area and high definition LCD television; Sleep Deep with our revolutionary Garden; Sleep System bed (in many rooms) - providing pressure - free comfort with adjustable firmness settings; and fresh and fluffy white duvet and high thread count linen. Call or email today to reserve your Guest Room Block - rooms are filling fast! And see the Deals section to take advantage of our Wedding Perk Packages!